Michel Foucault's involvement with politics, both as an individual and a writer, has been much commented upon but until now has not been systematically reviewed. This is the first major introductory study of Michel Foucault as a political thinker. 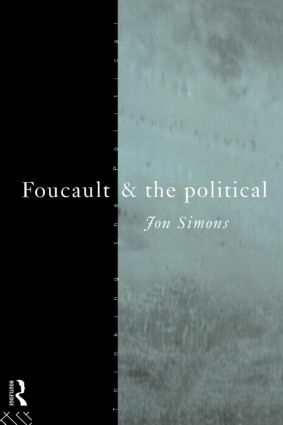 Jonathon Simons explores the importance of the political in all areas of Foucault's work and life, including important material only recently made available and the implications of various revelations about his private life. Simons relates Foucault's work both to contemporary political thinkers such as Michael Walzer, Charles Taylor and Jurgen Habermas, and to those challenging conventional political categories, especially people who write on feminist and gay theory, such as Judith Butler. Students of Foucault and of political and social theory, as well as those working in lesbian and gay theory, and feminist studies, will find this book essential.